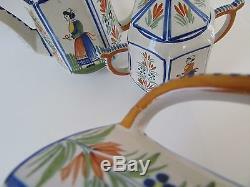 A wonderful set in overall good clean condition. 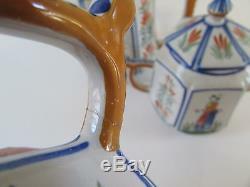 Cream pitcher handle has two light cracks on handle, still intact & is useable. Not seen unless closely inspected. 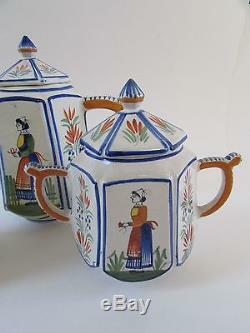 Each piece has a woman & man on each side. 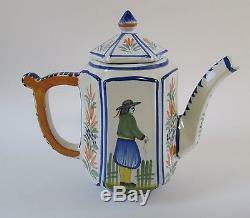 Teapot is 8" tall x 8 1/2" wide. 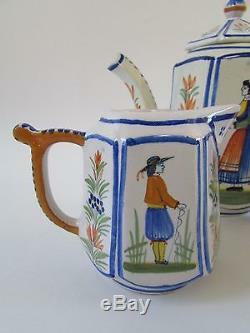 Creamer is 4 1/4" tall x 5" wide. 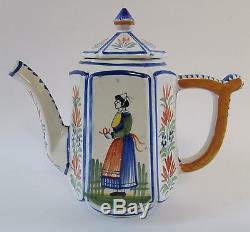 Sugar bowl is 6 1/4" tall x 7" wide. 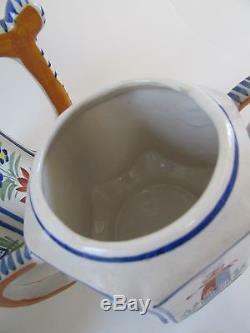 If you have a broken item or feel the item was misrepresented. Contact me within 24 hours. 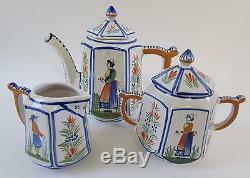 The item "VTG Henriot Quimper France Tea/Coffee Pot Set of 3" is in sale since Friday, May 05, 2017. 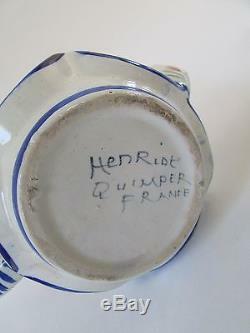 This item is in the category "Pottery & Glass\Pottery & China\Art Pottery\Quimper". 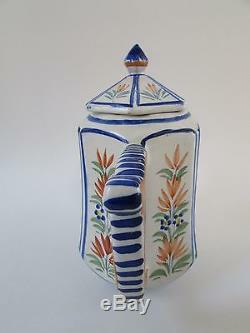 The seller is "thetayloredhome" and is located in Santa Fe, New Mexico. This item can be shipped to United States, Canada, United Kingdom, Denmark, Romania, Slovakia, Bulgaria, Czech republic, Finland, Hungary, Latvia, Lithuania, Malta, Estonia, Australia, Greece, Portugal, Cyprus, Slovenia, Japan, China, Sweden, South Korea, Indonesia, Taiwan, South africa, Thailand, Belgium, France, Hong Kong, Ireland, Netherlands, Poland, Spain, Italy, Germany, Austria, Russian federation, Israel, Mexico, New Zealand, Philippines, Singapore, Switzerland, Norway, Saudi arabia, Ukraine, United arab emirates, Qatar, Kuwait, Bahrain, Croatia, Malaysia, Brazil, Chile, Colombia, Costa rica, Panama, Trinidad and tobago, Guatemala, Honduras, Jamaica, Antigua and barbuda, Aruba, Belize, Dominica, Grenada, Saint kitts and nevis, Saint lucia, Montserrat, Turks and caicos islands, Barbados, Bangladesh, Bermuda, Brunei darussalam, Bolivia, Ecuador, Egypt, French guiana, Guernsey, Gibraltar, Guadeloupe, Iceland, Jersey, Jordan, Cambodia, Cayman islands, Liechtenstein, Sri lanka, Luxembourg, Monaco, Macao, Martinique, Maldives, Nicaragua, Oman, Peru, Pakistan, Paraguay, Reunion.